ACM SIGGRAPH 1993 Proceedings , 19-26. 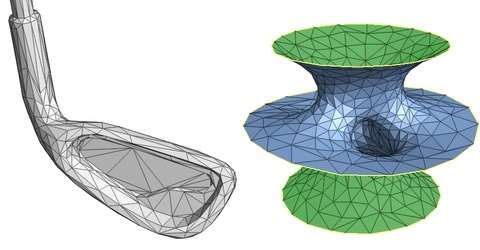 Traversing the space of triangle meshes to optimize model fidelity and conciseness. Abstract: We present a method for solving the following problem: Given a set of data points scattered in three dimensions and an initial triangular mesh M0, produce a mesh M, of the same topological type as M0, that fits the data well and has a small number of vertices. Our approach is to minimize an energy function that explicitly models the competing desires of conciseness of representation and fidelity to the data. We show that mesh optimization can be effectively used in at least two applications: surface reconstruction from unorganized points, and mesh simplification (the reduction of the number of vertices in an initially dense mesh of triangles). Hindsights: The technique demonstrates that general optimization can achieve surprisingly good results. This particular optimization searches over a broad space of both discrete and continuous variables to find a concise mesh accurately fitting a set of data points. A similar approach was used by Lindstrom and Turk in their Image-driven mesh optimization work. Mesh optimization is quite powerful for feature-sensitive remeshing, as it automatically migrates vertices onto sharp features (e.g. as used in multi-chart geometry images). For the application of mesh simplification, progressive meshes offer a more elegant solution.